Press Release posted 4/26/12 – The Pasadena Tournament of Roses® revealed today that Dr. Jane Goodall, DBE, founder of the Jane Goodall Institute and UN Messenger of Peace, will serve as the Grand Marshal of the 2013 Tournament of Roses festivities. On New Year’s Day, in front of a world television audience, Dr. Goodall will ride in the 124th Rose Parade® presented by Honda and themed “Oh, the Places You’ll Go!.” She will then toss the coin before the 99th Rose Bowl Game® presented by VIZIO. 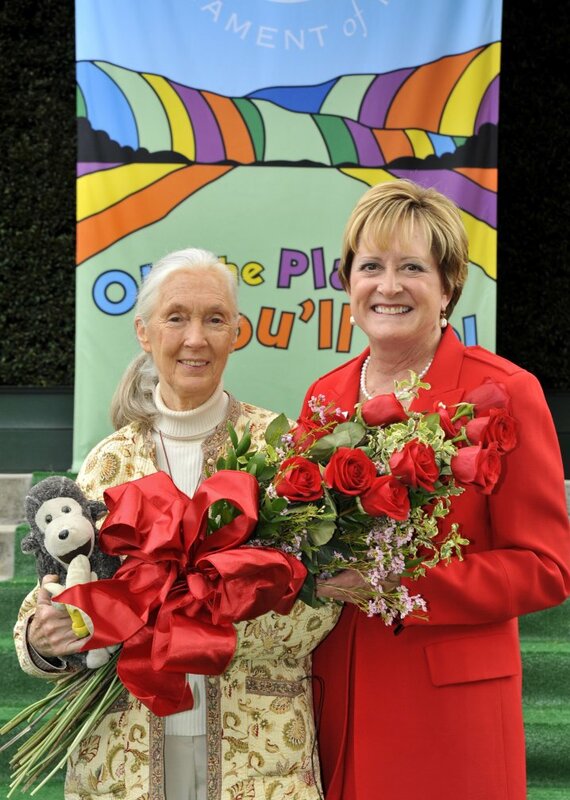 Dr. Goodall has been an inspiration to the Pasadena Tournament of Roses as the organization continues to seek ways to make the Rose Parade and Rose Bowl Game more sustainable by finding ways to evolve waste-management practices and inspire that change in those who participate in Tournament of Roses events. With the assistance of Three Squares International Inc. (TSI), a Los Angeles-based, globally recognized environmental consulting firm, continue to develop greening strategies for the Rose Parade and Rose Bowl Game and identify organizations to partner with and create sponsored recycling and greening efforts. TSI specializes in developing comprehensive sustainability plans for corporate entities, government agencies and academic institutions. Work in collaboration with Rose Parade participants to continue to pursue alternative power sources that could help to reduce emissions. In collaboration with the City of Pasadena, further enhance recycling efforts and diversion of waste material at Tournament of Roses-sponsored events. Provide Rose Parade band participants with reusable water bottles at the end of the Parade route. Provide event participants and attendees with recycling tips for their visit to Pasadena on New Year’s Day. These projects are just a few measures that the Tournament of Roses plans to put in place. Additional greening strategies can be found on the Tournament of Roses website at http://www.tournamentofroses.com/TheRoseParade/AboutUs/GreeningStrategies.aspx. For further information about Dr. Jane Goodall and the work of the Jane Goodall Institute, including Jane Goodall’s Roots & Shoots, please visit www.janegoodall.org and www.rootsandshoots.org.